As the winter months are upon us we thought we’d share one of our popular fish dishes. Simple and tasty, we know you will enjoy this hearty meal. Melt the butter in a pan, add the onions, shallots and leeks and cook until soft but not browned. Add the fish trimmings, cook for 2 to 3 minutes, then add the vermouth and wine and reduce until almost all the liquid has evaporated. Add the cream and bring to the boil, simmer for 5 minutes and remove from heat. Add the rosemary, garlic, salt and cayenne. Cover the pan and leave to infuse for at least 30 minutes. Pass the sauce through a strainer and add a little lemon juice to season. 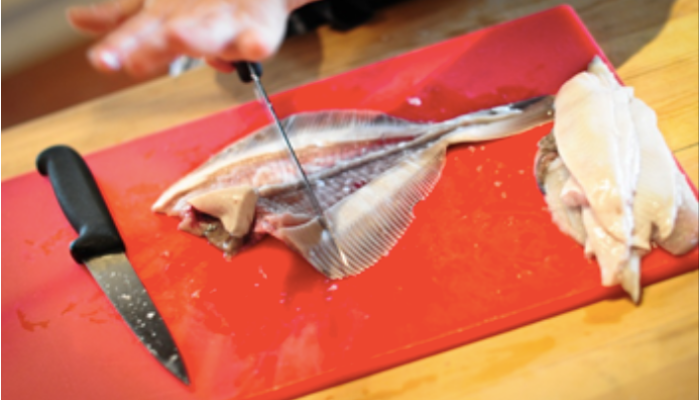 Poach or fry the fillets and serve with the re-heated fish velouté. The Gascony Cookery School would love to share more recipes with you. Come and join us on one of our courses – you will have the added bonus to get away from it all, immerse yourself in the French culture and way of life as well as meeting other like-minded students. Dave and Bernard’s years of experience mean you will learn the skills used by real chefs with the ability to apply them to your own kitchen at home. Check out our courses here.